TThe last time Middlebury adopted a strategic plan, it did so in the spring of 2006 with the introduction of Knowledge Without Boundaries. This plan specified three strategic goals and three strategic priorities—and a host of recommendations. Eighty-two of them, to be exact, enough to fill a 102-page hardcover book. The plan was bold, chockful of tantalizing items broad (adopt a new mission statement that reflects our aspirations and future directions) and narrow (search for creative ways to reduce reliance on private vehicles). There was a lot to be excited about and a lot to do. Unfortunately a global recession that burst on the scene in 2008 and lingered into 2009 reset priorities—both for Middlebury and across higher education. A lot has been learned since then, knowledge brought to bear in Middlebury’s latest strategic initiative. 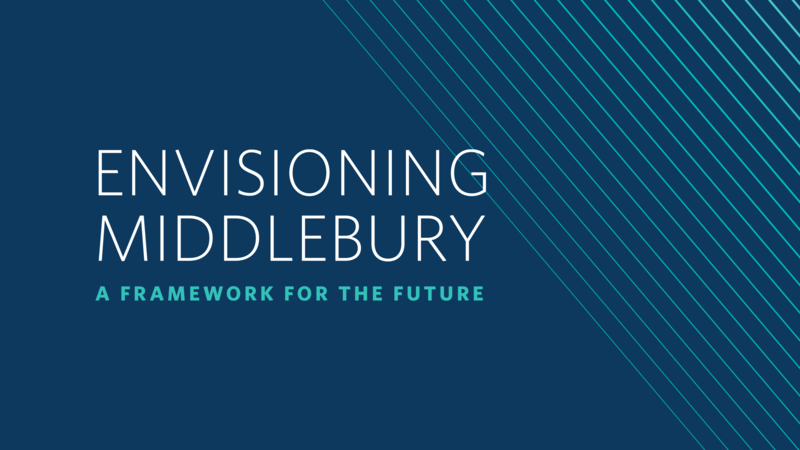 When President Laurie Patton announced an institution-wide effort called Envisioning Middlebury in the spring of 2016, she invited the community to engage in a yearlong conversation, work that would serve as a guide to the development of a strategic plan. But for the first year, she emphasized, “the conversation [would be] the strategy.” From the outset, Envisioning Middlebury was designed to be a different sort of planning process. Yes, there were committees—two of them, a steering committee and an advisory committee, comprised of faculty, staff, students, and administrators from throughout all of Middlebury’s programs and locations—charged with developing a revised mission statement and strategic directions. Yet their work was iterative, building off the conversations unfolding throughout Middlebury, conversations that took shape through surveys and speaker series and focus groups and community gatherings that emerged organically, from the roots up rather than from the top floors of Old Chapel. The result is a new strategic framework officially adopted by the Board of Trustees in October. That Middlebury’s strategy for the future is predicated on a framework rather than a plan should signal how different the approach has been. Envisioning Middlebury is nimble and wide-ranging, not a list of tasks or recommendations for shiny new things, but an active strategy that requires continual participation by faculty, staff, students, and alumni. Now we introduce Envisioning Middlebury to you. We know that you lead busy lives, and for many these lives unfold far away from the Champlain Valley of Vermont or the Monterey Peninsula in California. If we’re being honest, we know you’re not sitting around on pins and needles, eagerly awaiting your alma mater’s latest strategic initiative. But here’s the thing: when you take a look at what is happening at Middlebury and how the institution is thinking about and preparing for the future, we’re confident you will be excited and energized, and, we hope, eager to join in.